This facility, established in 1995, is recognized as a state of the art treatment facility located in Charlestown, Indiana. The site is five acres with over 860,000 gallons of storage and a 13,000 square foot processing building with a storage capacity of 1,200 drums. All tanks and drum storage are located within secondary containment. Three separate solidification pits are located in the building and provide the capability to unload bulk sludges directly into them from vacuum trucks and tankers. 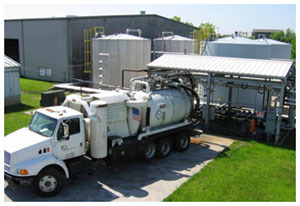 The Resource Recovery Center operates as a non-hazardous treatment plant and includes railcar service, loading and off-loading for tanker trucks, roll off carriers and tractor trailers. Emergency response and field services divisions as well as a transportation hub are also located at this facility to ensure quick and efficient service to all of our clients. 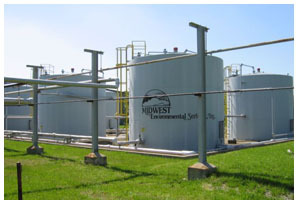 Want more information on the Charlestown, Indiana location or any of the facilities owned and operated by Midwest Environmental Services? Contact us online for more information, or call 800-388-5160. Click to read more of what our customers are saying about us! Midwest Environmental Services is always looking for talented, team-oriented people to join us.